This past Saturday was the Exploratorium's first "Educator's Night." Not only was there free food and drinks, but there was a special edition of the Iron Science Teacher*. I've previously competed in the event, and I was happy to volunteer again. * Parodying the cult Japanese TV program, “Iron Chef,” the Iron Science Teacher showcases science teachers as they devise classroom activities using a particular ingredient—an everyday item such as a plastic bag, milk carton, or nail. 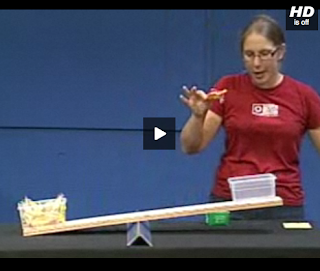 Contestants are drawn from the Exploratorium Teacher Institute and compete before a live audience. 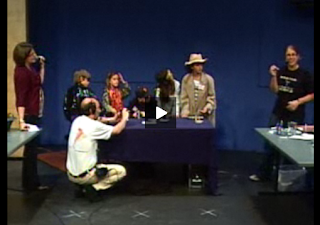 Apparently, back in 1997, the museum's high-tech webcast studio was looking for new shows. During a staff brainstorming session, a fan of the Japanese cooking show (which aired on a local television network, without subtitles, at the time) suggested naming a secret ingredient for science teachers to use in an experiment to present to the audience. "It was honestly and truly a joke," Linda Shore, Director of the Teacher Institute and host of the show, said, "We thought we'd do one show." Now 10 to 12 shows are produced annually for the Exploratorium's Web site, many of them during summer institutes. "Secret" ingredients (which are actually revealed to participants in advance so they can practice) have included everything from ordinary baking soda and food coloring to Marshmallow Peeps and pantyhose.